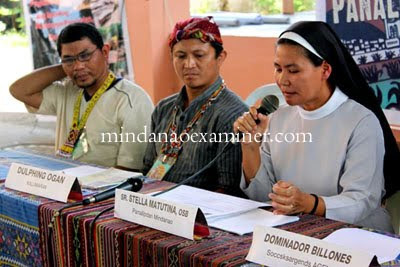 Sister Stella Matutina, Secretary-General of Panalipdan Mindanao, speaks during a news conference in Digos City in Mindanao. DAVAO CITY (Mindanao Examiner / Apr. 30, 2011) – A Filipino environment coalition called ‘Panalipdan Mindanao’ said the Aquino government should stop pushing for large scale mining operations in the country following the deaths many villagers in a landslide that hit a mining community in Compostela Valley’s Pantukan town. The group lamented the deaths of more than a dozen people and said Manila should think twice before pushing allowing liberalized large scale mining and other activities that pose threats to communities. In a news conference in Digos City that coincided with Earth Day, the group said Aquino should heed the Pantukan incident as a warning. “It is the irony that the Aquino administration pursues liberalized large-scale mining which brings about far greater effects of waste spilling, denudation of forests, and depletion of water resources. The government’s eleven priority large-scale, open-pit mining projects in Mindanao promise to be exponentially destructive,” it said in a statement sent to the Mindanao Examiner. “The Pantukan incident showed the dangers posed by the mining industry and stressed the need for government to regulate small scale mining along nationalist development goals,” it said, adding that Aquino's Mindanao 2020 program is potentially damaging since it promotes industries that destroy natural resources. Sister Stella Matutina, Secretary-General of Panalipdan Mindanao,’ said what Filipino communities need is food security rather than so-called development projects that damage resources, such as mining, hydro and coal-fired plants, and agri-business expansion. “Such projects have shown its negative impact towards communities, harming their sources of livelihood,” she said. Hundreds of people from various organizations have attended Panalipdan Mindanao’s Earth Day conference from April 25 to April 27.